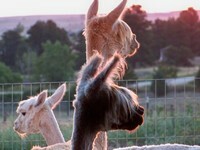 Female Cria from Mont Blanc Son at Side! 59.5 Density! 6.2 Spread!! Top 2% SD! Maya looking good! October 2017. Solid, alert and friendly girl. Sire Goldyn Rae's Mystic Brown! 22.2 micron! Top 2% SDAFD EPD!! Bred!!! Bred to Kahuna Lexus son! 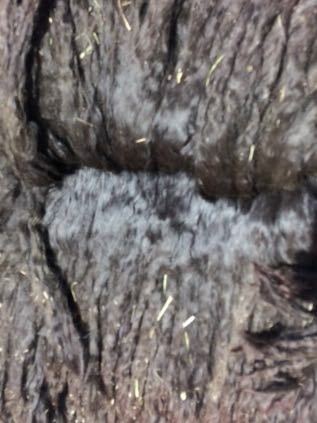 A 2013 Futurity Auction purchase, Blue Ginger exhibits lusterous and fine fleece. She has presence plus, a correct sturdy frame and a regal head. With her sire LCA Huckleberry de Latah, 2012 Futurity Dark Herdsire of the Year, Blue Ginger is a complete package with her superb genetics. SIRE OF 2017 BLACK NATIONAL CHAMP! OUT OF 25 MALES! We are thrilled to announce part ownership in Bojack!!!! Bojack is now owned by 4 suri breeders! HE IS THAT GOOD!! First cria have arrived and they are a STUNNING!! He is producing a variety of colors including grey and black. Many of his offspring have wrinkled skin which indicates excellent density! Goldyn Rae's Dark Maya is a true black female out of our own Mystic Brown. She exhibits high luster, consistent color and great conformation. Maya won First Place at GWAS 2017 and finished Third Place out of 10 animals in a tough AOA National Show competition. She is a big, strong girl! 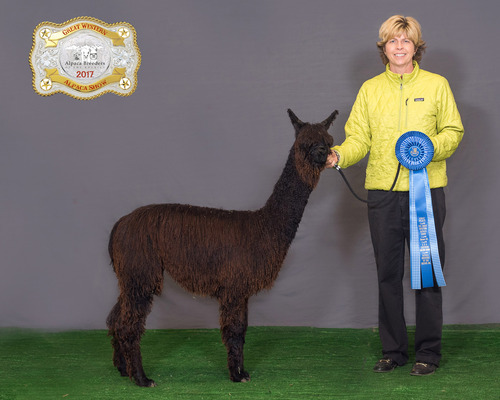 Maya's sire, Goldyn Rae's Mystic Brown, is an award-winning grandson of champions CHAKOTAH of CCR Suris and Sierra Bonita’s SIRIUS BLACK. He had a great show record and received the "buttery fleece" judges comment on more than one occasion. MYSTIC has an excellent disposition, great conformation, straight legs, coverage down to his toes, perfect bite, that ideal Suri head, and outstanding luster. Mystic's third year histogram results were OUTSTANDING: 21.8 micron with 3.7 SD, 17.1% CV and 2.1% > 30. This dark brown boy is sporting fiber stats you would desire in most whites! Mystic's biopsy results (3 years of age) are AMAZING! 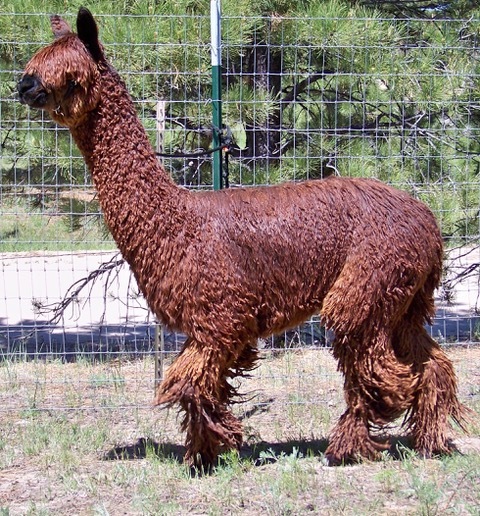 Maya's dam is our 2013 Futurity Auction purchase, Huckleberry's Blue Ginger, who exhibits lustrous and fine fleece. She has presence plus, a correct sturdy frame and a regal head. With her sire LCA Huckleberry de Latah, 2012 Futurity Dark Herdsire of the Year, Blue Ginger is a complete package with superb genetics. Check out stats for Goldyn Rae's Nazca - Histogram, Biopsy and EPD's!! Same mom! 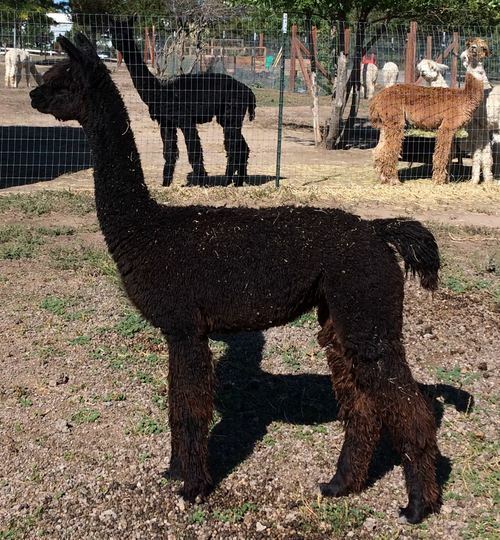 This girl has great genetics and fleece stats for a dark black female. 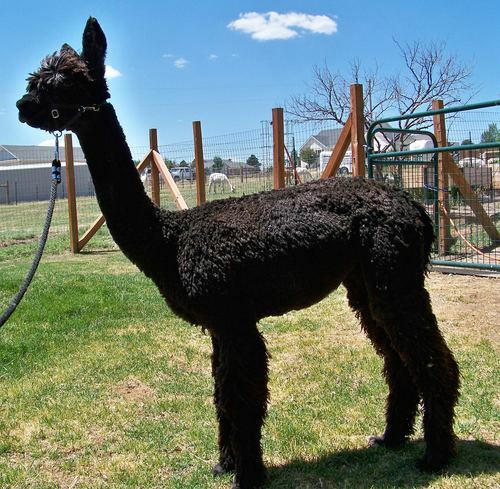 Her sire Mystic Brown sports a 59.5 density and her dam Blue Ginger produced a female (Nazca) with a 72 density. Maya is currently bred to Goldstar's Bojack (confirmed 11/16/18 via ultrasound). CHECK OUT MAYA'S 2018 EPD!! SIRE MYSTIC BROWN HOLDING OUTSTANDING EPD's INCLUDING TOP 2% SDAFD! !